Music stimulates the brain, prepping it to absorb learning and memories. LifeSounds Educational Services founder Chris Brewer states that "students of all ages - that includes adults - generally find that music helps them focus more clearly on the task at hand and puts them in a better mood for learning." Not only that, children can build stronger, more retentive minds by learning instrument notes and dance steps. Research shows that music lessons boost children's academic performance. Some of the world's most creative, thriving individuals are trained in an instrument. There are multiple layers to the connection between achievement and music. Learning scales, rhythms, and beats provide building blocks for understanding mathematics. Plucking guitar strings, playing drums, pounding piano keys, and twirling joyously all help refine motor skills. Music also hones listening skills and the ability to connect abstract ideas. Just hearing music enriches the learning environment and improves neural function. My girls love to dance! They dance together, they dance with me, and they dance with friends. It's a natural and exciting form of expression that gains momentum in groups. 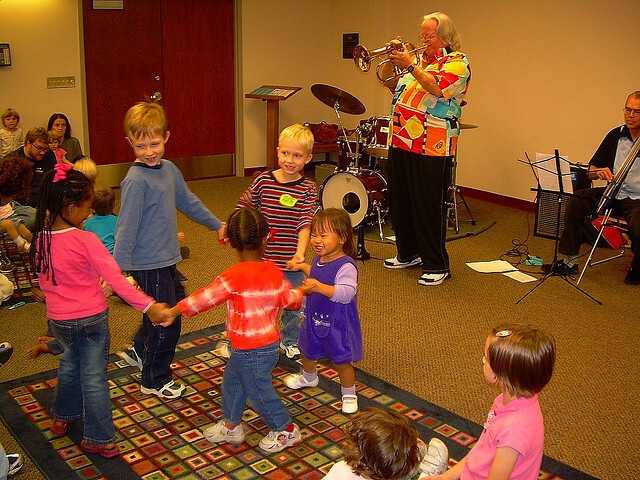 Music or movement classes encourage kids to communicate freely and learn together. Not only does it create a common interest, kids can enjoy a sense of progress as a team as they master a dance sequence or blend music together harmoniously. It's just plain fun - and fun invites friendship! Kids feel proud when they nail a routine or a tricky song, and that pride fuels their excitement to keep learning, keep practicing, and keep playing. Additionally, I appreciate how music and movement teaches kids to accept feedback, respond to constructive criticism, and let go of perfectionism. The special talent becomes a valued part of their identity that will evolve with them. Dancing is a workout, no doubt about it! Since physical activity is essential for happy, healthy kids, dancing is just perfect! It unites joy and movement, creating a positive correlation that will hopefully last throughout life. Dancing improves flexibility, motor skills, and cardiovascular strength. Plus, the variety of styles and steps can help create balanced growth for kids. Music is both an empowering and comforting way for children to express themselves. There is endless freeedom in movement and song. Kids can channel their creative whims through the musical skills they develop. Children love to make noise and be heard; music is a fantastic conduit for that spontaneous energy! As adults, we are aware of how toxic supressed emotions can be. Through playing an instrument or dancing, children can discover safe, healthy ways to work through feelings and relieve stress. They can transform confusing thoughts into something audible and tangible. In fact, when infants are exposed to the singsong voice of their parents, it helps develop innate knowledge of emotions early on. Hans Christian Andersen once said "where words fail, music speaks." Creativity is the very essence of music and dancing! Activities that invite free expression within a mentally stimulating framework sparks children's creativity. As they commit songs to memory, kids will build up the courage to try improvisation and spinning their own tunes. Billy Holiday once said, "I never sing a song the same way twice." Musical training of any kind requires discipline and commitment. Combine that with passion and joy, and your kids will be playing the tune of success! Consider the exquisite artistry of ballet, the intense rhythms of drumming, and the delicate precision of playing the violin. Even if your kids are just having fun and trying new things, they are still tapping into the wonderful, enriching world of music. Every culture across the word shares a strong, dazzling thread - music! Children can explore the culturally lush landscape by listening to music of all kinds. Through participation, they will gain appreciation and respect for the global variety of self-expression. This can help your children become open-minded, adaptable individuals. I hope this post has inspired you to introduce your kids to the brain-building, expressive world of music! Do your children participate in music? We would absolutely love to hear about it!